Tile is a beautiful waterproof and heat resistant surface used for countertops. The tiles can be made from ceramic, porcelain, stone, or concrete materials. Ceramic tile, especially, adds color, texture, and pattern to the decor. The use of custom designed tile installations personalize a room and make it unique. Ceramic tile has been used for centuries for a variety of surface applications. Tile is available in many colors, patterns, and price ranges; ceramic tile shapes and sizes are limited only by the designer's imagination. Edge pieces, inserts, and relief design pieces can be combined with plain tile to create an endless variety of designs. Ceramic tile is formed from pressed clay and is available either glazed or unglazed. Unglazed tile, while more rustic, requires more frequent sealing and cleaning because it is more porous than glazed tile. Porcelain tile, a type of ceramic tile, is made from clays that are less absorbent than those used for ordinary ceramic tile. Porcelain tile is fired at a high temperature, thus making it hard and strong. Other materials that are sometimes installed as tile countertops include stone and concrete. 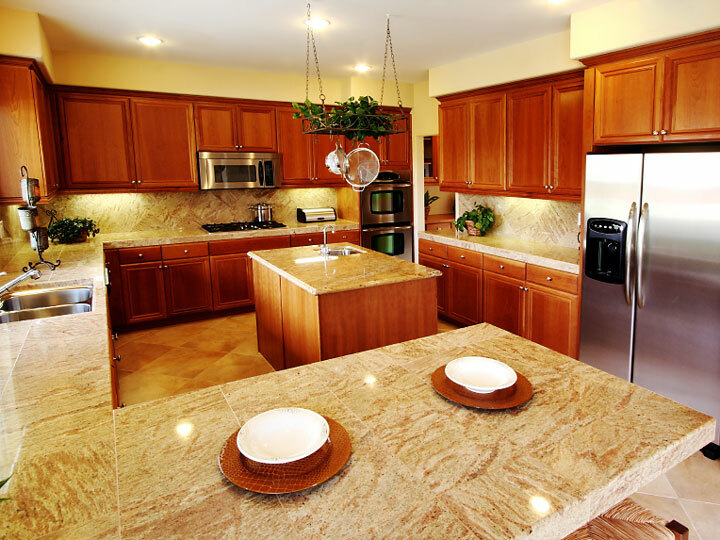 Granite is usually used when stone tiles are selected for a countertop. Granite tiles are most often available in 12-inch squares. Marble may also be used, but it is more likely to stain or crack than granite. Concrete is another material that is made into tiles for countertop use. Concrete tiles are not fired like ceramic tiles, but they are available in just about any color and are about 24-25 inches square in size — the usual countertop depth. Concrete tiles can also be made for backsplash use. On a kitchen countertop, tile can be installed with a tile edge, or it can be used just as the surface, with another material for the edge. 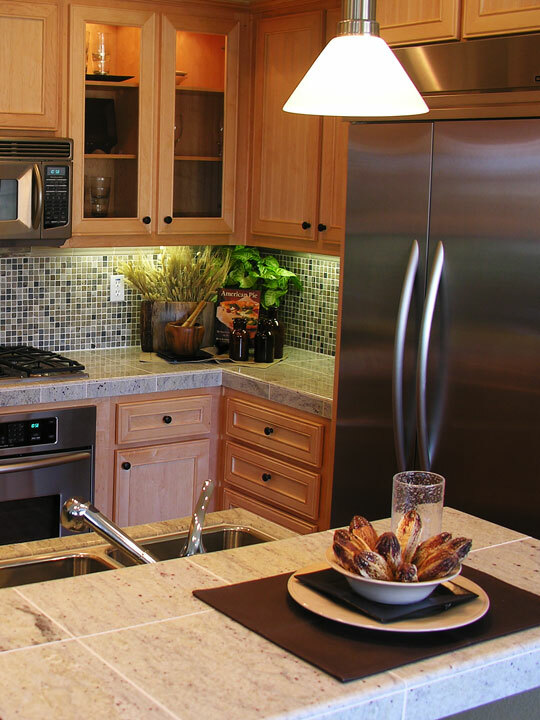 Tile makes a wonderful backsplash and can be installed in eye-catching designs and colors. 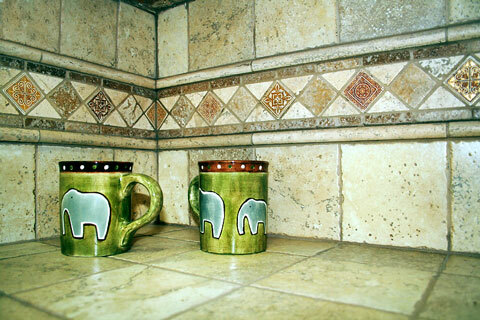 Mosaic tile murals or custom painted tile "pictures" can offer interesting highlights for a backsplash. While tile is heat and water-resistant, the grout surrounding the tile will require maintenance. All grout, white or colored, should be sealed. Regular cleaning and sealing will help keep the grout joints free of stains. A mixture containing bleach may keep white grout looking clean. Tile requires installation on a sound surface of plywood or cement backer board, or it may come loose over time. Check with your supplier for the proper cement and grout that should be used to install your tile. Tile can also chip and crack. Keep a few extra tiles in case one needs to be replaced. 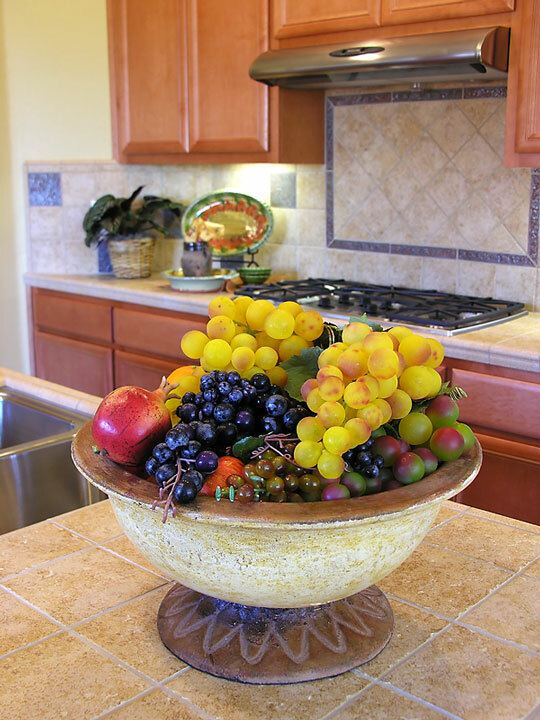 Bear in mind that ceramic tile, while beautiful, can pose problems on a kitchen countertop. These tile surfaces are uneven and may not be suitable for pastry baking, etc. Tile surfaces may be more suitable for accent or serving areas where surfaces are easier to clean or next to a stove where a heat-resistant surface is convenient. Best Tile - ceramic tile and decorative backsplashes. Daltile - ceramic, glass, stone, saltillo, and porcelain tile. Imagine Tile - custom digital images on ceramic tiles. Marazzi Tile - stone, ceramic, porcelain, and glass tile. Oceanside Glasstile - handmade art glass tile products. Waterworks - ceramic, glass, and mosaic tile collections. Waverly Tile - ceramic bisque tiles and hand-painted tile murals. Tile Heritage Foundation - historic perspectives on ceramic surfaces. Tile Council of North America - ceramic tile trade association. Butcher Block Countertops - pros and cons of butcher block counters. 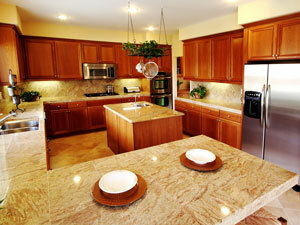 Granite Countertops - pluses and minuses of granite counters. Laminate Countertops - laminate countertop overview and resources. Quartz Countertops - pros and cons of engineered quarts counters. Soapstone Countertops - soapstone counters introduction and resources. Solid Surface Countertops - solid surface countertop materials.